How do I remove the extra space on the right side of this a element? 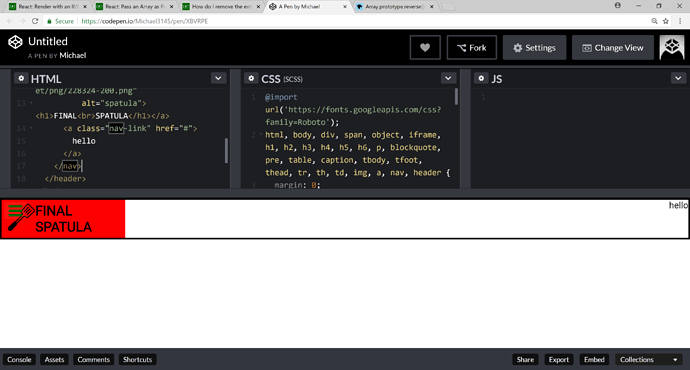 Can someone tell me why there’s extra space on the right side of the a element whenever I open my website in Chrome? I managed to get rid of the extra space before I added the nav element but as soon as I added it, the extra space came back. I feel like it has to do with how the nav element interacts with the parent element or the flexbox. Please help. but have you tried to add borders around everything so you can see where things may be encroaching on their given space? 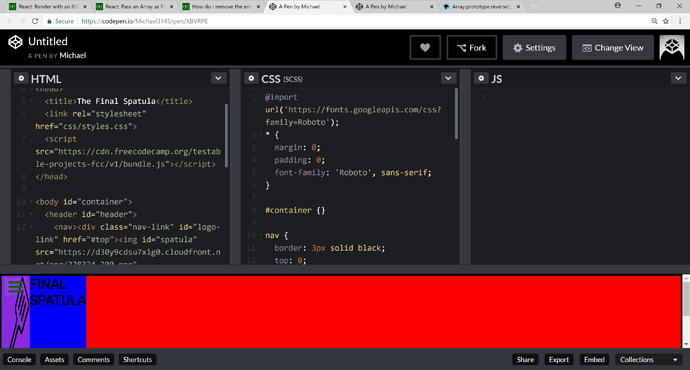 that’s the code as a codepen, do you want to make the whole nav red or something else? so just to confirm the issue, the problem you want to get rid of is all the extra space between the red area and the word ‘hello’? Oh sorry for not being clear guys. I wanna remove the red space on the right side of “Final Spatula”. The extra space on the right side of the a element. I forgot to edit the first sentence from “nav element” to “a element”. sorry I didn’t respond right away but it looks like you changed your page in the meantime? it looks like you fixed the OP’s original problem? Click on the codepen that @Michael55555 created for you. It turns out the reason for the extra space is that I used a percentage value for “#spatula”'s width. There’s no extra space if a pixel value is used. I don’t know why it works that way but at least the extra space is finally gone. It’d be great if anyone could explain the technical reason behind it, though.